We have been getting this question a LOT lately, so I thought I would write up a quick article about it. This is actually one of my most desired features of Airbnb, and I was really excited when they launched it. People often ask us how to have their minimum number of nights (min nights) set for a long stay in the future, say two or three months down the road, and set to only 1 or 2 minumum nights for the present. Well luckily, there is now a way to do this in Airbnb! We will show you how, or scroll down now if you just want the “how” and not the “why”! This made a big difference in how we manage Airbnb accounts at VR Front Desk, and I recommend you add these management practices to your own toolbox to help you increase your revenue and occupancy rates as well. Why have different minumum night settings anyway? The first thing to consider is whether this would apply to you or not. I think in most cases, it is a good idea. Our general rule of thumb is that the longer period of time away from the present day, the more minimum nights we require. For instance, do you really want a 1,2,or 3 day stay 6 months from now? No! Absolutely not, that could potentially leave you with quite a big gap in your calendar. But for a booking next month, likely all the big gaps have already been taken. So squeezing in a 3 day stay to bring occupancy up is a great idea. So, our settings are usually 6 nights minimum 6 months out, 4 nights minimum 3 months out, and 1 or 2 nights minimum if the booking is within the next 3 months. Now that is for a market where most people book 3-6 months in advance, and many book a year in advance especially for the most popular dates. If your market is different, you can take the above principles and just change the time frame. For instance in a shorter advance booking market, maybe make 3 months out require a 6 night minimum, etc. The only type of owners where we don’t recommend this is those that have a fixed booking period, like Saturday-Saturday rentals. Obviously in that case, just keep doing what you are doing and renting by the week. 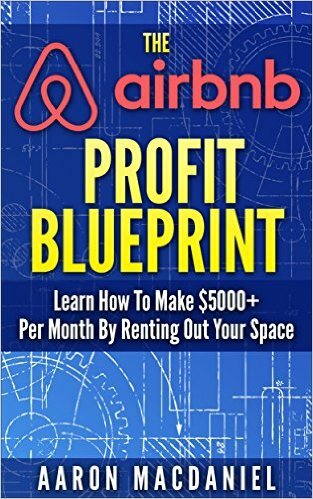 How does with impact Airbnb Insta-Book? One of the main reason people don’t like using Insta-book is because they lose control. And that we totally get! But with a loss of control you can also increase your revenue, so you have to balance the pros and cons. And one of the ways to bring you more control is this very feature we are about to show you. By keeping very tight control of your minimum nights in different seasons, you are much more likely to get the kind of bookings you want to get! 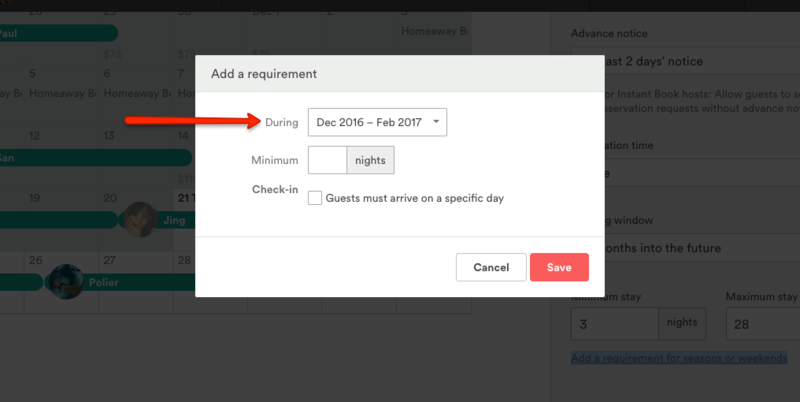 So read on below to see exactly how to set different nightly minimums for different time periods in Airbnb. OK now down to brass tacks, how do we change the minimum nights. Go to your listing calendar, then click availability settings. BTW – I think this button is a bit of a misnomer. You don’t have to define an entire season if you don’t want to! You can in fact, just define a minimum night for only one night! Or a week that is very popular in your area. Or any length of time you like, the tool itself is very flexible! This is what pops up after you click the “Add a requirement” button above. You can choose Airbnb’s predefined responses, which are sometimes useful! Or you can get more specific by selecting “specific dates”. This useful feature lets you set ANY date range in the future with a minimum night settings. OK there you have it, an in-depth review of how and why to set your minimum nights to get maximum bookings! Hope that helps. As always, leave any questions or comments in the Comment section below. 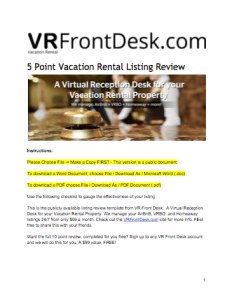 And if you want some professional help to manage your listing, sign up for VR Front Desk Today!